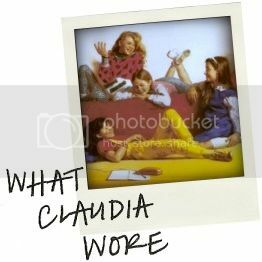 Claud was wearing a fake leopard-skin vest, a fairly tame blouse, and blue leggings. She had made her jewelry herself - five papier-mache [always with the papier-mache] bracelets that were painted in soft desert colors. Then there was Kristy in her jeans and turtleneck [dammit Kristy]. And finally Mal and me, also in jeans, but wearing (if I do say so myself) pretty fresh [fresh = cool, for those of you who've forgotten that the baby-sitters have not discovered drugs and alcohol yet and thus have to entertain themselves by making up annoying slang] sweat shirts. And Mal had been allowed to buy high-top sneakers with beaded designs on the sides!" Goody for Mal. I think we'll all sleep better tonight knowing that her high-tops are beaded. One small victory for fashion-challenged eleven year olds everywhere. Well, thanks a lot. I've heard that plenty of times, but it never gets any easier. Most people say it when they find out what a dud I am in school. (I can barely spell. [sigh]) I think this teacher meant, though, that Janine and I don't look alike. We certainly don't dress alike. For instance, that day, Janine was wearing one of her usual plain outfits - a long pleated plaid skirt, a white shirt with a round collar, stockings, and blue heels. Her hair is short and cut in a pageboy, so she can't do much with it. I, on the other hand, was dressed in one of my usual wild outfits - a very short black skirt, an oversized white shirt with bright pink and turquoise poodles on it, flat turquoise shoes with ankle straps, and a ton of jewelry, including dangly poodle earrings. My long hair was swept to one side in a high ponytail held in place with a huge pink barrette." I'm pretty surprised that the barrette didn't have a poodle on it. You gotta love when La Martin uses the crutch of comparing wardrobes to illustrate how different they are. "If I were handed a check for $250, I'd run to Bellair's Department Store and buy this really neat Day-Glo green sweater with charms knitted into it that I'd seen on sale. [Classic Claudia. I love it.] Then I'd go to the art store and buy some new oil paints, a good supply of brushes, and this great silk-screening set I've had my eye on. After that, if any money was left over, I'd hit the candy store in a bad way. Mmm - Baby Ruth bars, Three Musketeers bars, M & Ms (plain and peanut), Reese's Peanut Butter Cups . . . Oh, the possibilities were mind-boggling." And delicious. And, to cap it all off, some bsc style for you all to enjoy - particularly Stacey's 'funky New York sweatshirt'. "I glanced around my bedroom. Every single one of us had leaned forward. On the floor, Jessi in her jeans and ballet leotard, and Mal in a new sweater dress, were leaning forward. On the bed, Stacey in a funky New York sweat shirt, Mary Anne in one of Dawn's baggy t-shirts, and I in a Day-Glo-striped top and skintight knit pants, were leaning forward. And on the desk chair, Dawn, wearing an outfit of Mary Anne's, had cocked her head toward Kristy." "And her clothes! Nobody dresses like Claudia. She is totally cool. She wears funky stuff like pink sparkly high-topped sneakers, or short flared skirts over skintight leggings, or wild jewelry she's made herself. She's good at pottery and is always creating earrings (she has one hole in one ear and two in the other) or beaded necklaces or bracelets." Leggings. No comment. But seriously, if she (or Ghostwriter) had strung those items together, it'd kinda be an outfit. A ridiculous one, but I think we've established that's pretty much par for the course at this point. Later, at a meeting, they start talking about what they're going to wear to some dance. These girls LOVE going to dances. 'You had candy in your room and you didn't eat it?' I said."